The duration of training is 3 years. After graduation, the students will be equipped with professional knowledge and practical skills. They will be able to work effectively, individually or in group with creative application of technology. Concurrently, they will be better at solving complex technical problems, and capable of self-study. Those skills will adequately prepare the students for higher level of learning. The duration of training is 4.5 years for full-time engineering programs, 4 years for full-time economics programs and 5 years for all part-time programs. Students will be trained to holistically develop physical strength, mental power and moral qualities. After graduation, they will possess professional competences, good computer skills, proficiency in a foreign language and other necessary skills (working skills, communication skills and soft skills). Critical thinking, self-study, cooperation and competition skills will be enhanced. The duration of training is 2.5 years for engineering programs and 2 years for economics programs. Students will be trained to holistically develop physical strength, mental power and moral qualities. After graduation, they will possess professional competences, good computer skills, proficiency in a foreign language and other necessary skills (working skills, communication skills and soft skills). Critical thinking, self-study, cooperation and competition skills will be enhanced. In addition, the students will be capable of self-study for life-long learning. The duration of training is 1.5 to 2 years. 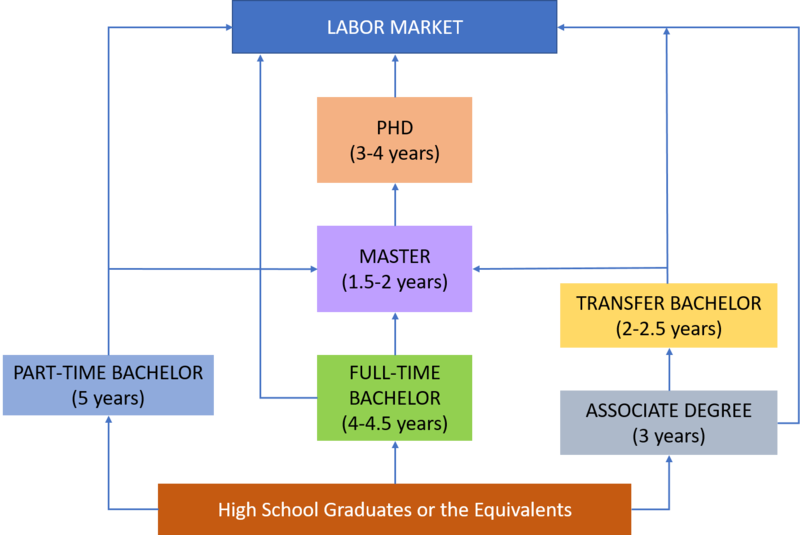 Graduates master the theories and can apply them effectively. They will be able to work independently and creatively, accurately detect and solve problems in their majors. The duration of training is 3 to 4 years. PhD graduates possess advanced professional competency. They will be independent and & creative in scientific research and technology transfer. They will also be capable of detecting and solving problems effectively. These courses include postgraduate seminars, technology transfer courses and various professional certificate programs; as well as IELTS preparation classes for postgraduate candidates who plan to study abroad.